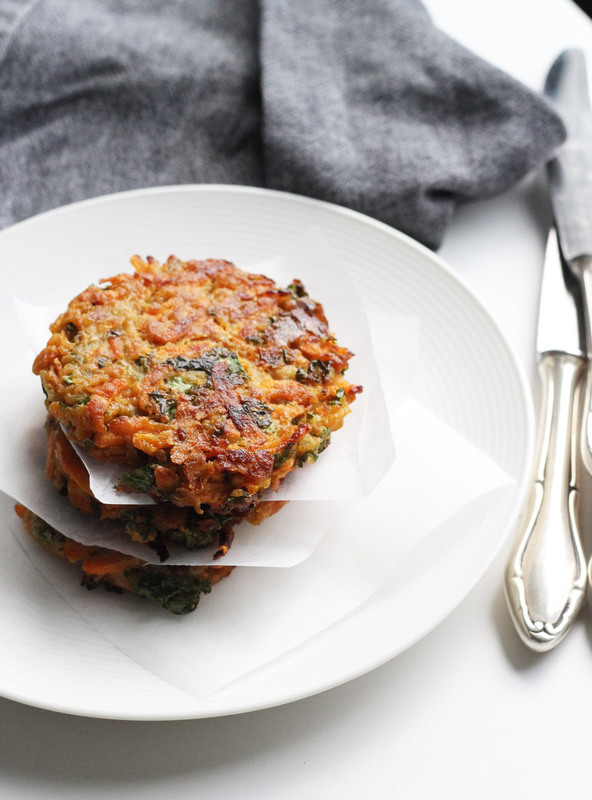 These are chunky, yet deliciously crispy and savoury carrot patties. They are on of my favourites to make. I enjoy these with a cold sauce and a side salad. The recipe yields approximate 7 patties, depending on size, mine where approx 8 cm i diameter and 1 cm in thickness. To make these gluten-free just use another flour. The secret to getting the crisp outside is the rapeseed oil. Mix grated carrot, onion, garlic and kale in a large bowl. Pour over the chickpea liquid. Mix well. Add salt, pepper, and lemon juice. Add the half of the flour and mix well. Add half of the water until you have a sticky dough that will stick together once pressed. Add more flour and water until you have the right texture of the dough. Preheat a frying pan with rapeseed oil. Form patties with clean hands and add to the hot oil. Make the patties approx 1 cm thick. Fry on medium heat in the beginning to ensure the carrot patties are fried throughout. (8-14 minutes depending on size). Then heat up the pan in the end to get that crispy and delicious golden brown texture on the outside. Repeat until the entire batch is done.